Edge of Tomorrow is an electrically paced blockbuster, entertaining and light but not intellectually barren. The script is tight, funny, and moves quickly with its very odd timeline (it’s like a messed up Groundhog Day), the acting is reliably good from the well rounded cast, the visuals are outstanding, and the direction is usually pretty stable. And most importantly for a summer action movie, it’s fun. It definitely achieves great levels of entertainment, enough to take it through the occasional narrative rough spot. The story begins when a group of aliens called mimics descend upon earth, quickly swallowing nearly all of mainland Europe in its grasp. A massive resistance of the world’s military forces is gathered. William Cage (Tom Cruise) is an American major whose army career has been characterized by choosing options that give him the least amount of combat time as possible. One day, he is called into the defense’s headquarters in London, where General Brigham (Brendan Gleeson) informs him that he will be assigned to a group that will be part of a large invasion onto the coast of France, where they will push in and defeat the enemy. When Cage refuses, Brigham has him arrested. Cage blacks out in the ensuing struggle, and wakes up on the middle of the Heathrow Airport runway, which has been transformed into a base of soldiers. He soon finds that his records have been edited – he is now listed only as a private, and is assigned to a ragtag group of soldiers. The next morning, everyone is dropped onto the beach, where unexpectedly, the mimics are waiting, ready to fight back. It’s a disaster. Cage is killed, but wakes up back in the middle of the base, like he had before. We soon find that he has entered a time loop – every time he dies, he awakes in the same spot the day before. After a few cycles, he meets up with Rita Vrataski (Emily Blunt), a highly decorated sergeant who informs him that she was once in the time warp as well, and its cause is related to the mimics. Now, they must apply the ability to relive the same day, using it to gather experience and learn information that may be vital to the future of the war. Tom Cruise does what Tom Cruise does best – deliver his lines while fighting off the monster of the day. That’s not to say that’s a bad thing, he’s usually good at what he does, and Edge of Tomorrow is no exception. Emily Blunt gives a great performance as the soldier with a cold, professional exterior, but also with an investment in the events that transpire as the film progresses. Brendan Gleeson’s interpretation of the stereotypical movie general is expectedly good, and Bill Paxton’s loud Kentucky-based drill sergeant is a nice addition as well. It probably isn’t much of a stretch to say that nearly every substantive character in Edge of Tomorrow is some variant of an action or sci-fi movie staple (there are more that I haven’t mentioned), but they’re written interestingly and the performers imbue them with enough life to keep it from becoming a problem. 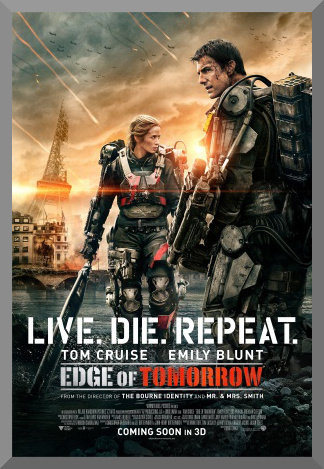 The first act of Edge of Tomorrow is mainly Cage restarting the day over and over again. It’s like a video game, which is a descriptor that can also be applied to the visual style of the movie. It’s a mostly smooth, glossed over kind of action, which emphasis that this a movie that won’t dig into too much. While that kind of touch-and-go ideal hurts the story it sets up a bit, which is more in the business of thoroughly building up than thoroughly explaining, it’s good for providing an enjoyable film. The screenplay, based off a Japanese novel entitled All You Need is Kill, deserves credit for its own sense of self-awareness, not afraid to throw a joke in to keep the mood from become overbearing. In Edge of Tomorrow, director Doug Liman provides a good and likable 113 minutes. It does have some script problems with keeping its plot points as smooth as its pacing, as well as an ending that like it could have been modified just a little bit (I want to say how it could have been improved, but I’d spoil the whole thing). However, this is effectively distracted by the commendable work done in visuals, acting, and most other aspects of the writing. This is a harmless summer blockbuster that does what it does with a good amount of intelligence and coherency.